VINEYARD VISTA is a very unique, 2 bedroom, 1 & 1/2 bath beach bungalow with screened porch, large back yard and off street parking. Nestled in the farmlands of West Cape May, VINEYARD VISTA is a guest cottage located between Cape May, Cape May Point and Sunset Beach. This unique area of Cape May is ideal for birding, biking and just relaxing. All beaches on the island are about 2 mile from Vineyard Vista. Enjoy quiet evenings on the screened in porch. This newly renovated 1920's cottage is right across the street from Willow Creek Winery and Les Rea's Farm. Just down the street from Beach Plum Farms. In the morning, go for a bike ride along quiet Stevens St., or take a short bike ride to West Cape May, Cape May or Cape May Point. Walk through the Nature Conservancy's bird refuge on the way to the cove beach and lighthouse. (about a 1 mile walk). Outdoor shower w/hot and cold water. Outdoor shed for bike storage. This property is within walking distance to beach, birding areas such as the Cape May Meadows and Rea's Bean Farm and even a small farm market. Bike to downtown Cape May, Cape May Point, or Sunset Beach, where one can see an unobstructed view of a beautiful sunset. This Island Cottage awaits your relaxing vacation. Vineyard Vista overlooks a 50 acre winery, Willow Creek Winery and 100 acre farm, Rea's Farm. And is just down the road from Beach Plum Farms. Nestled in the farmlands of West Cape May, VINEYARD VISTA is a guest cottage located between Cape May, Cape May Point and Sunset Beach. Gorgeous Mahogany screen porch overlooks Willow Creek Vineyard and Les Rea's Farm and The Beanery (a world destination birding site). It is just down the road from Beach Plum Farm. This unique area of Cape May is ideal for birding, biking and just relaxing. There is a big backyard with seating for 6 and a propane grill. A locked shed is also available for bike storage. Parking for 2 cars. Susan is also an ordained minister, so if you are getting married or renewing your vows in Cape May, she can preform your ceremony as well. Please contact her for detailed information. Perfect location for a getaway! 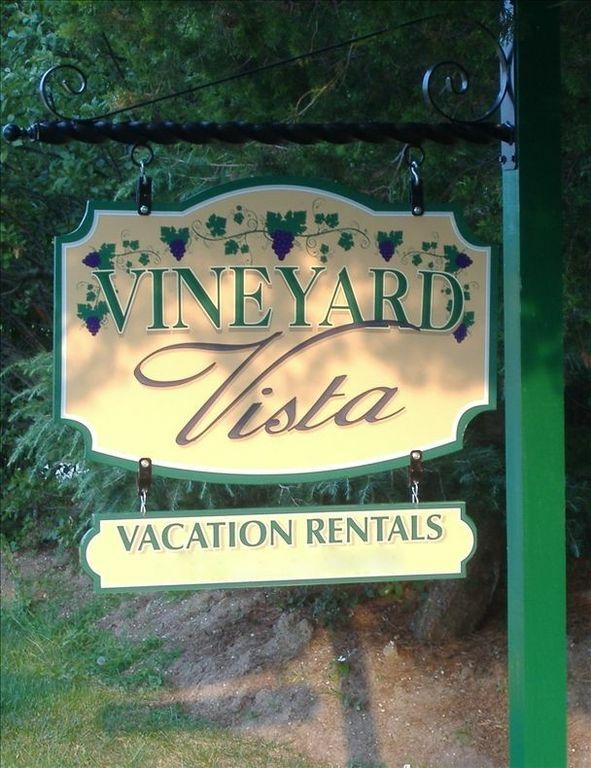 My husband and I stayed at Vineyard Vista and it proved to be the perfect rental for us. We love what West Cape May has to offer. This house is walking distance to Willow Creek Winery, Beach Plum Farm, The Bird Observatory, and our favorite walking beach The Cove. The house was clean and tidy with a beautiful front porch perfect for catching the sunset over the Vineyard. We hope to visit Vineyard Vista again this summer! The house had the perfect size for us 3 and our baby and toddler. Clean and comfortable, everything working fine. The extra 1/2 bathroom was very convenient and the outdoor shower with hot water, delightful. The kitchen was quite well equipped, although (as usual in all rental houses) knives were kind of blunt so if you like cooking bringing a knife sharpener would be a good idea. The internet connection was very good but TV had just basic channels and not the best image quality. Remember that sheets and towels are not included, so you must carry them from home or rent them at local stores as we did (we used linenladies.com and paid around $100 for a week including beach towels and umbrella). I would recommend this house to a friend and come back with my family. Perfect rental for our family of four. Great clean cottage, centrally located! Beautiful view of the winery from the screen porch. The West Cape May farmland and vineyards of Cape Island should remain an insider's secret! While Cape May bustles with delicious activity and Cape May Point offers spectacular beaches where the ocean joins Delaware Bay, WCM brings the wide open spaces for long bike rides and cricket-filled nights. Landlady Susan is warm and helpful (she lives next door), the beds are comfortable, the kitchen is huge and open to the living spaces, and the vineyard view from the room-for-all screened-in front porch is serene. What's not to love? Vineyard Vista is located in West Cape May between Cape May City and Cape May Point, overlooking the majestic Willow Creek Farm and Winery and The Beanery (a world destination for birding!). Vineyard Vista is just down the road from Beach Plum Farm as is nestled among the farms on the island, yet centrally located from all Cape May beaches! Just 2 miles from Cape May Point beaches, Sunset Beach, Cape May beaches and Higbee Beach.